In March 2015 Square Enix announced that it would shut down the PlayStation 2 and Xbox 360 versions of Final Fantasy XI by the end of March 2016. This would coincide with the Rhapsodies of Vana’diel expansion to “tie together the last 13 years of the game” and usher console players over to the PC version. After March 31st, 2016 it is not possible to transfer screenshots, macros, gear sets, and map markers from the console version of the game according to a PlayOnline post. 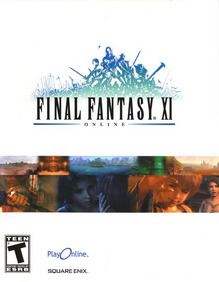 Final Fantasy XI is the first MMORPG capable of simultaneous multiplayer action across three different platforms, allowing players worldwide to combine forces on Windows, PlayStation 2 (U.S. and Japan only) and Xbox 360. Final Fantasy XI players from all over the world can unite in one gaming universe in a community of more than 500,000 players, and 1.7 million characters. In Final Fantasy XI players will create unique characters that will evolve within Vana’diel – a world once bound by a peaceful alliance between nations, but now threatened by an ever growing evil force. They will experience missions, quests, and battles either by themselves or by joining up with other party members to form powerful alliances as they explore the incredibly vast environments that make up Vana’diel.